Going on trips is always fun, but it does kind of mess with your routine. We drove home really early this morning, and ended up going right back to sleep when we got home. After catching up on some sleep, we woke up to an invitation from Corey’s mom to go to lunch at an Italian restaurant that she and I absolutely love. Anytime she’s craving it, she calls us up and says, “Will you guys go eat red sauce with me?” I’m always on board for that! Our impromptu nap resulted in me skipping breakfast, which is something I try to never do. But, sometimes it happens! We hopped in the car and headed to the restaurant, which is called Adriatico Trattoria. 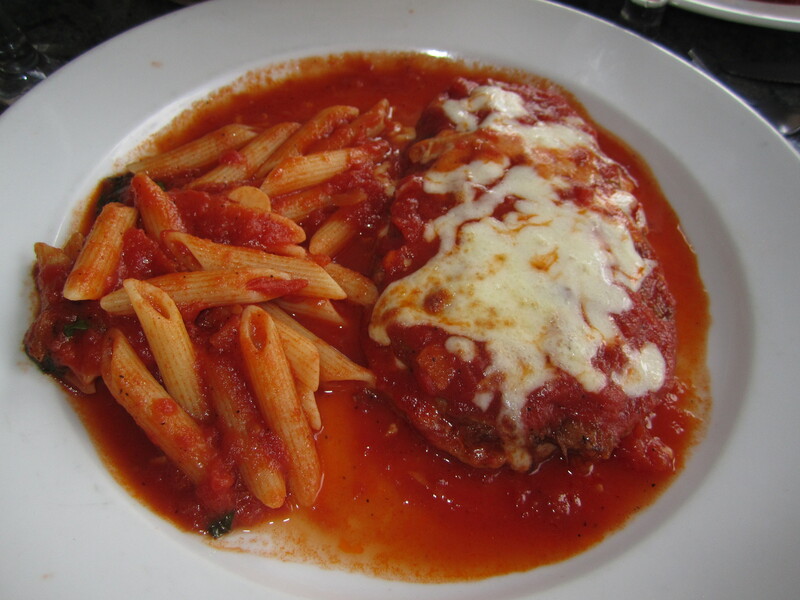 I always order the same thing, which just happens to be my favorite meal of all time- Eggplant Parmesan! This dish is to die for. Although it is certainly not a health food, this particular Eggplant Parmesan is much lighter than other restaurant-versions, because Adriatico lightly cooks it in olive oil, and then bakes it, as opposed to frying. Their marinara sauce is so amazing that we always order extra sides of it with our meals! I had every intention of taking half of my lunch home, but somehow…my plate was practically licked clean. See what happens when you skip breakfast?! 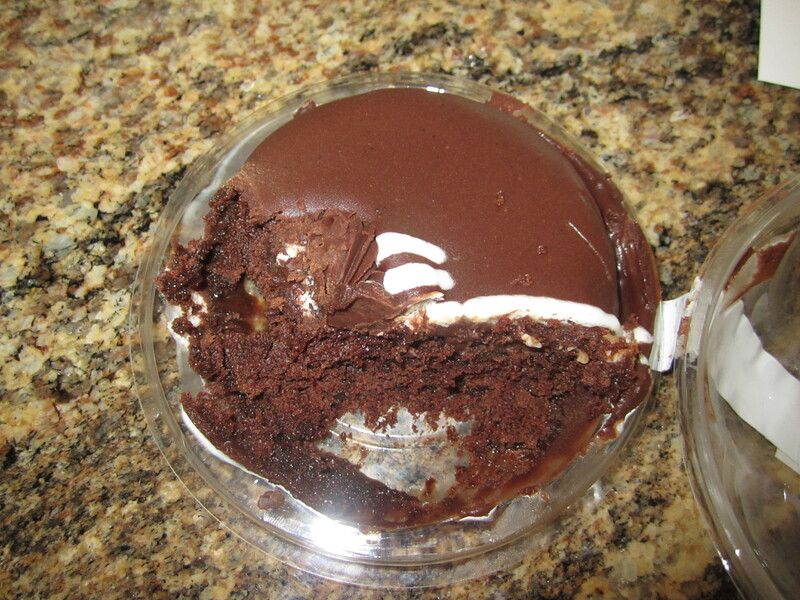 A yummy chocolate fudge mini cake from Whole Foods! I like to consider everything that comes from Whole Foods to be healthy, so let me just live in my dream world where this cake is calorie free, just for today 😉 . 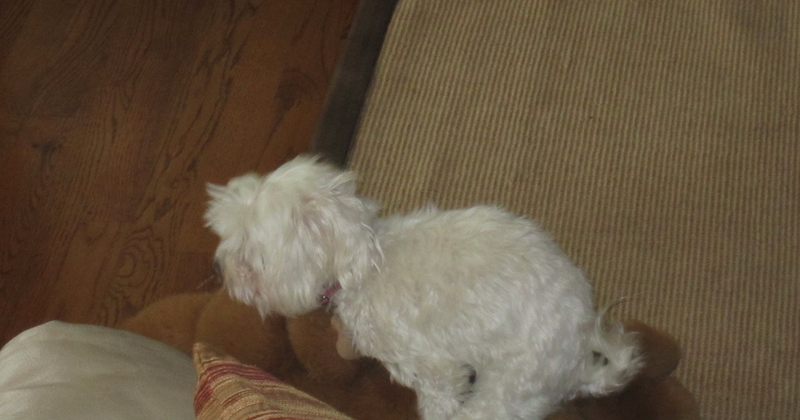 We brought Bella over to the house with us so she could play with Corey’s family dog, Zoe, while we went to lunch. What I’m about to show you is mildly disturbing. You’ve been warned. I had to stealthily sneak the camera over the edge of the couch to get this picture, because if she knows we’re looking at her, she stops and then slumps away in embarrassment. She’s a GIRL dog for crying out loud! Where did I go wrong?! After lunch, we came home and hung out for a while before getting ready and going to church. We don’t normally go to church on Wednesdays, but today is Ash Wednesday, which marks the beginning of Lent- the days leading up to Easter. After my dad told me that this was what he was giving up for Lent, I started thinking about it and realized that it would be a great thing for me to give up, too. 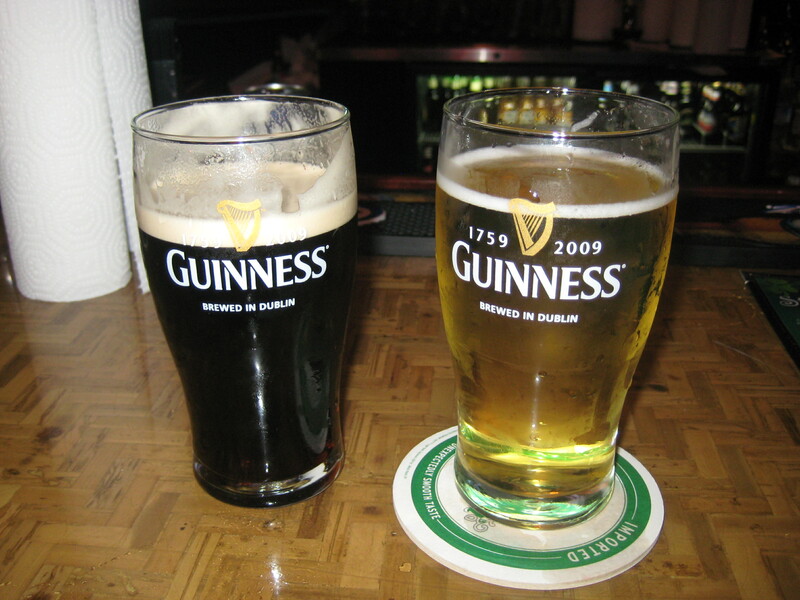 I really don’t drink during the week, but, seeing that we are in college, drinking is kind of the thing to do on the weekends. Not anymore! You can just call me Sober Sally for the next 40 days! Woo hoo! 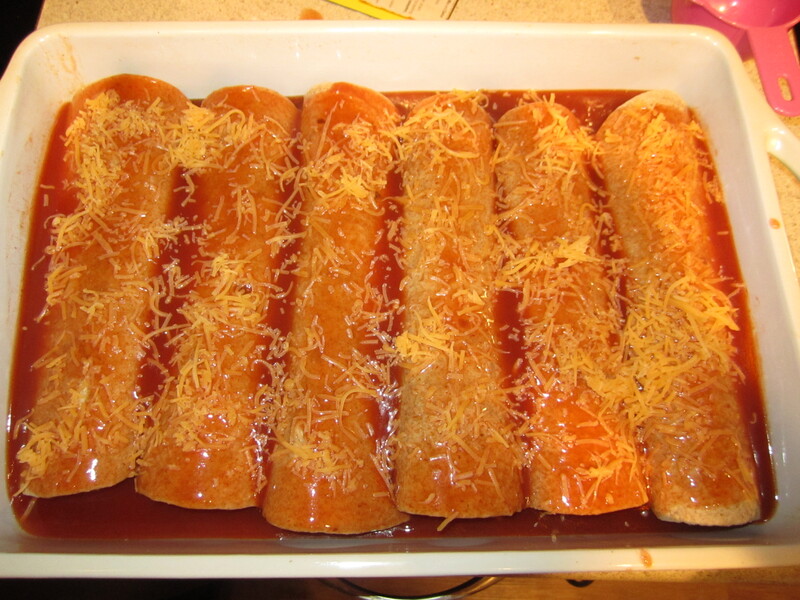 I decided to make an old favorite with a twist, and ended up with a baking dish full of Turkey Enchiladas! Preheat oven to 350 degrees. 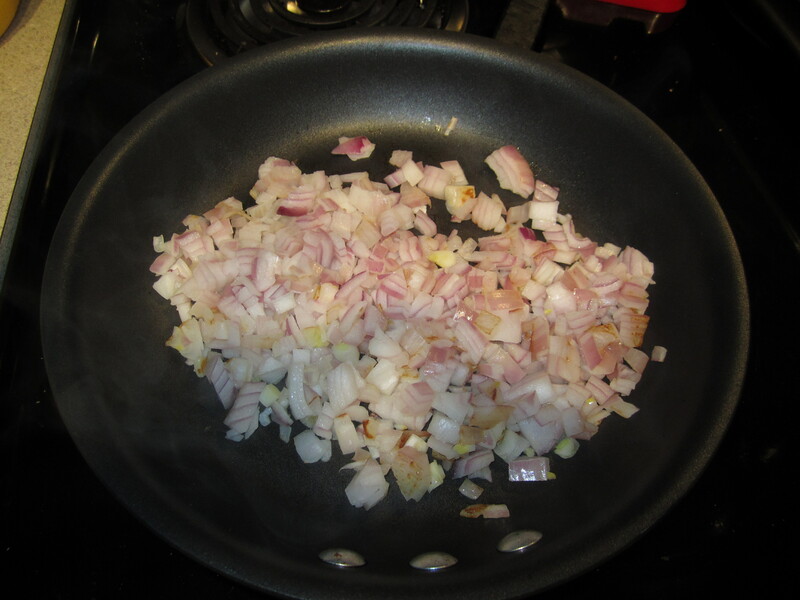 Spray a skillet with cooking spray and add the chopped onion. Cook until translucent, about 5 minutes. 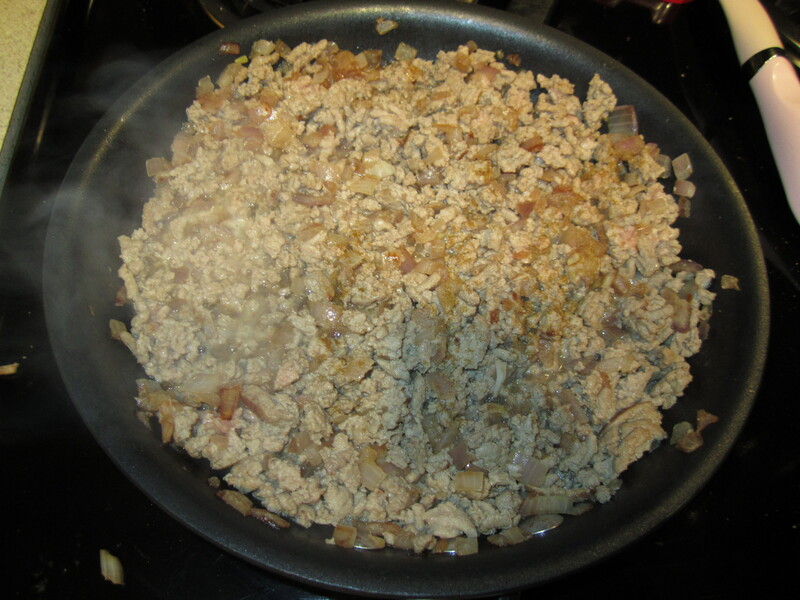 Add the turkey meat and cook until browned, about 5 minutes. 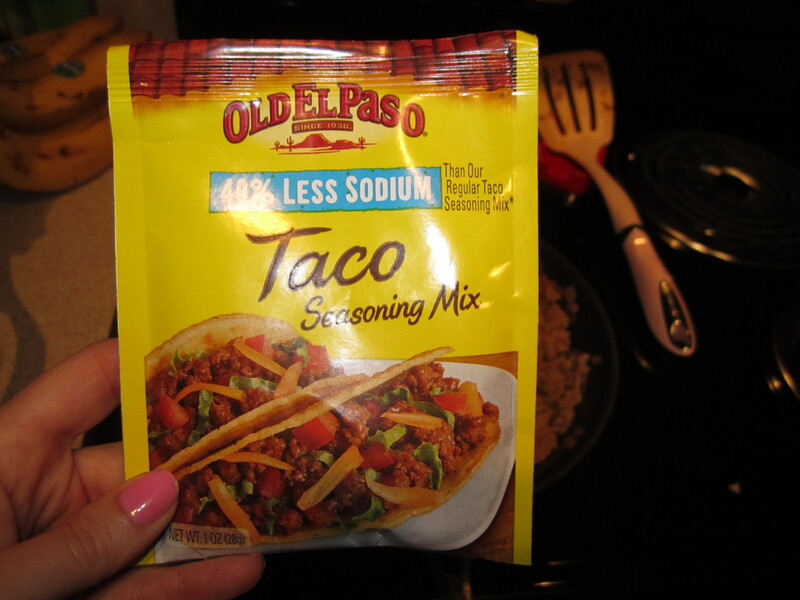 Drain the oil from the meat, and then add the taco seasoning and 1/2 cup water and mix together. Continue cooking for 2 minutes. 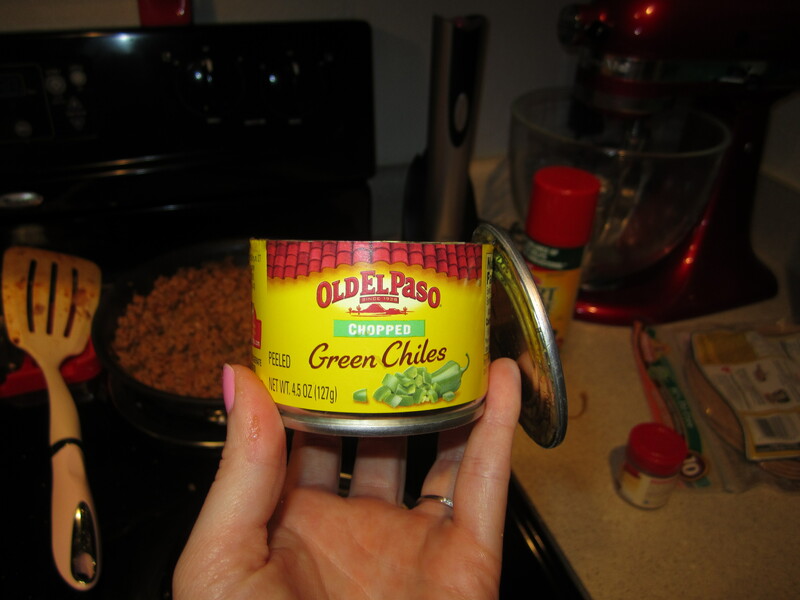 Add the can of green chiles to the meat and mix together. 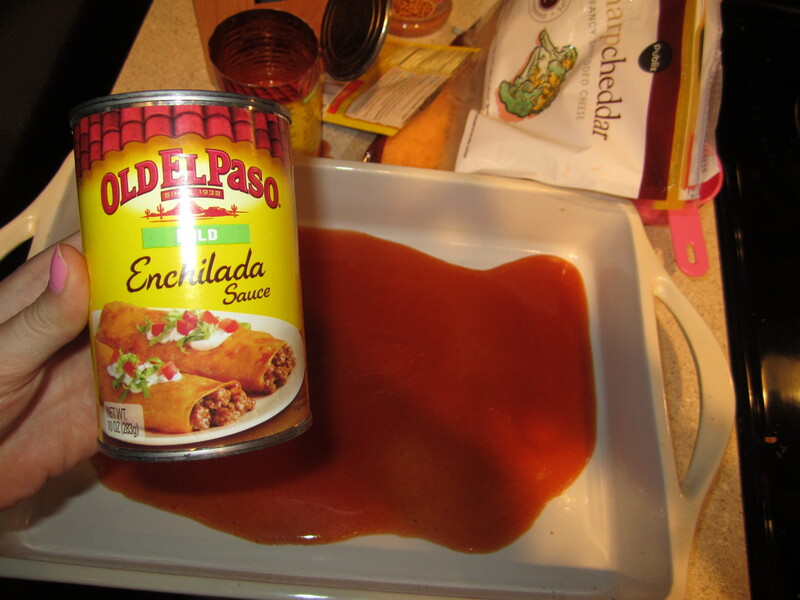 Next, pour 1/2 of a can of enchilada sauce into the bottom of a baking dish. 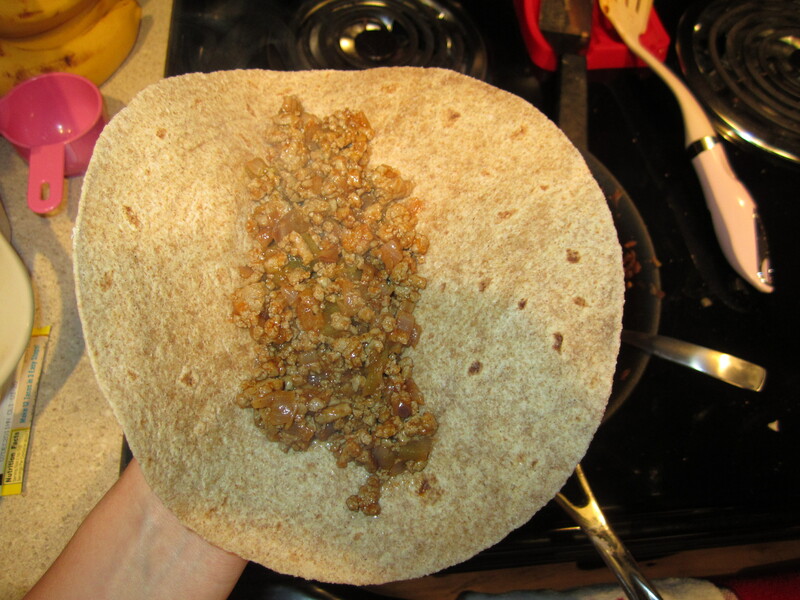 One by one, fill each tortilla with a few spoonfuls of the meat mixture. 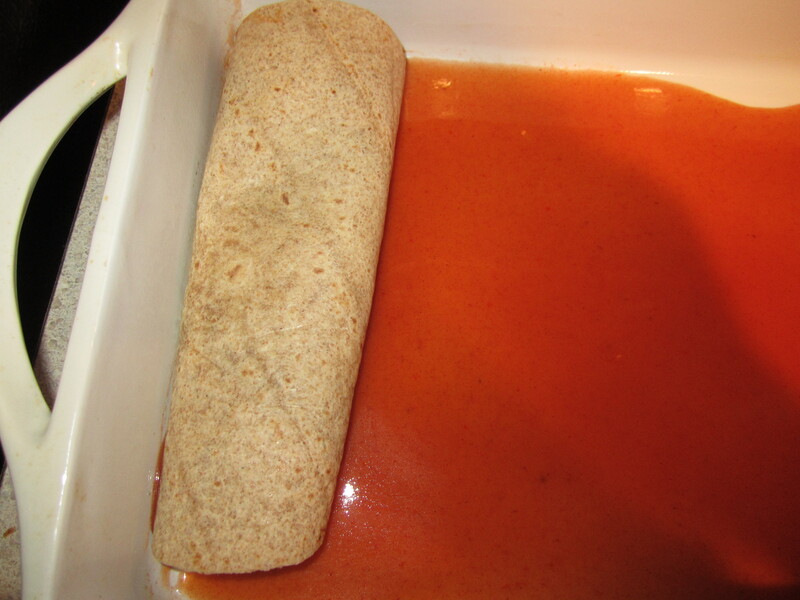 Fold the sides in like a burrito, and place seam side down in the baking dish. 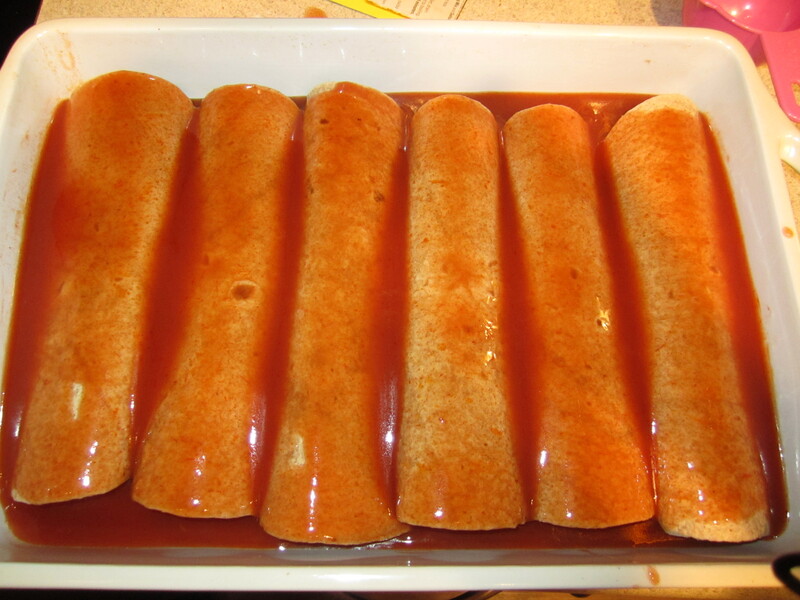 Pour all of the remaining enchilada sauce all over the finished enchiladas. Top each one with cheese. 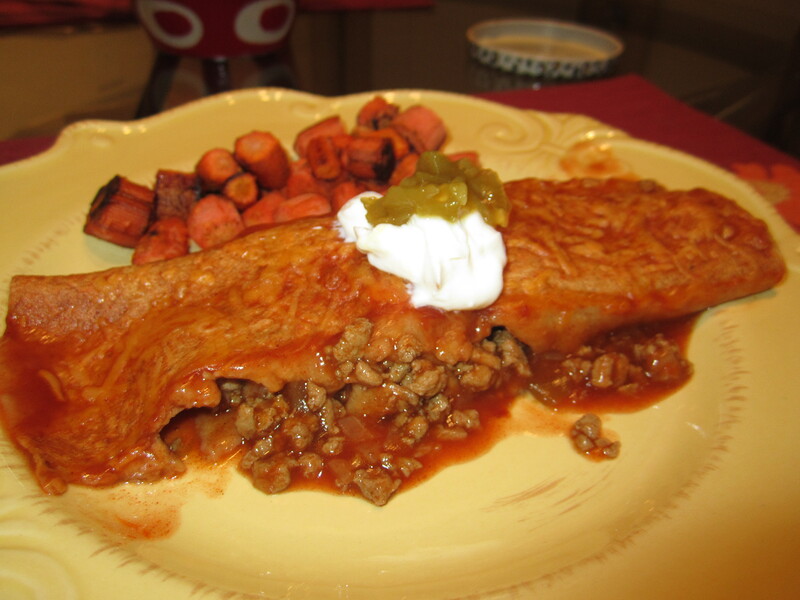 Bake for 30 minutes, then serve topped with a dollop of sour cream. 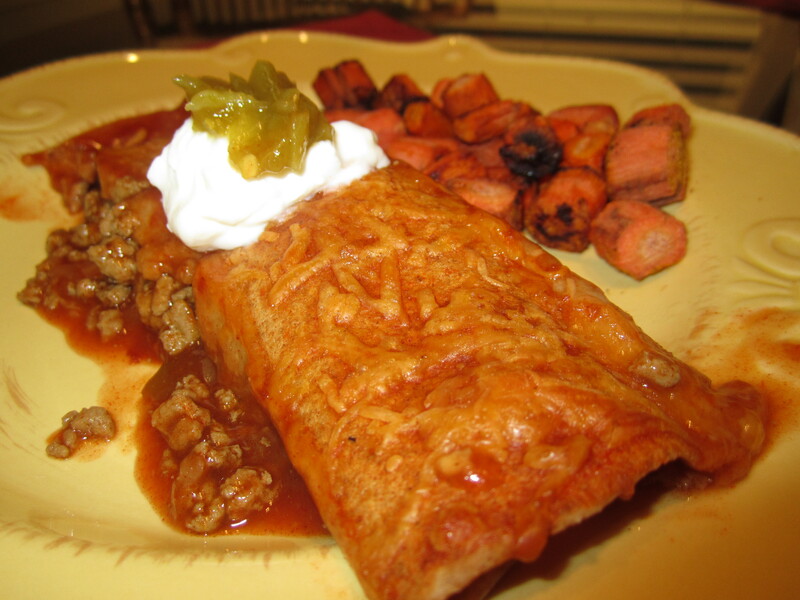 I served our enchiladas with a side of roasted carrots. Yes, carrots. I have no idea why, but I was really craving cooked carrots! They were a lovely compliment to our Mexican feast. 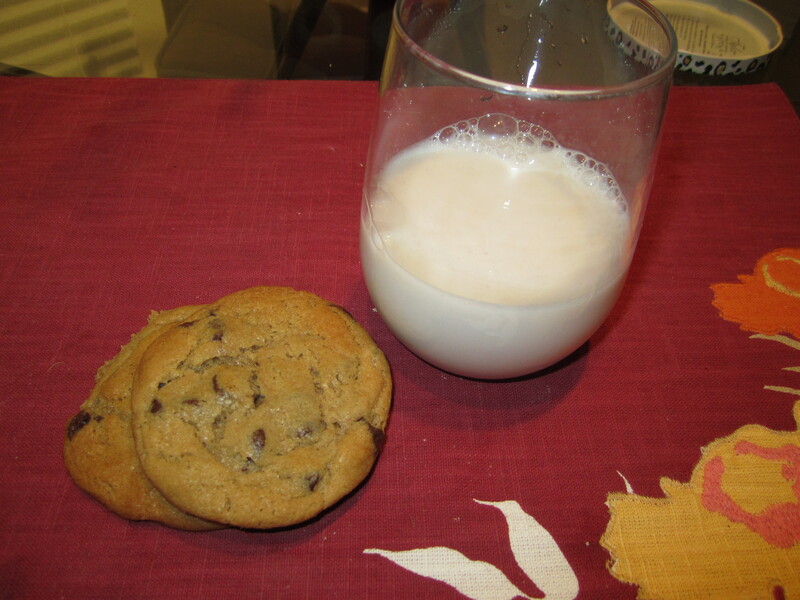 After dinner, I baked a batch of chocolate chip cookies for dessert. Unfortunately, I wasn’t quite in the mood to create my healthy Whole Wheat ones, so these just came from a tube. I also had a glass of almond milk! Well, I’m going to go attempt to catch up on my missed sleep! Have a great night! Are you giving up anything for Lent? If so, what did you decide to give up?